Newly released documents prove Comey spent months crafting his excuses for allowing Clinton’s criminal behavior to go unpunished. Comey’s efforts to black out the truth finally failed. Thanks to the Freedom of Information Act, the FBI released a document that shows Comey sought input as he drafted his response to Clinton’s email server scandal. 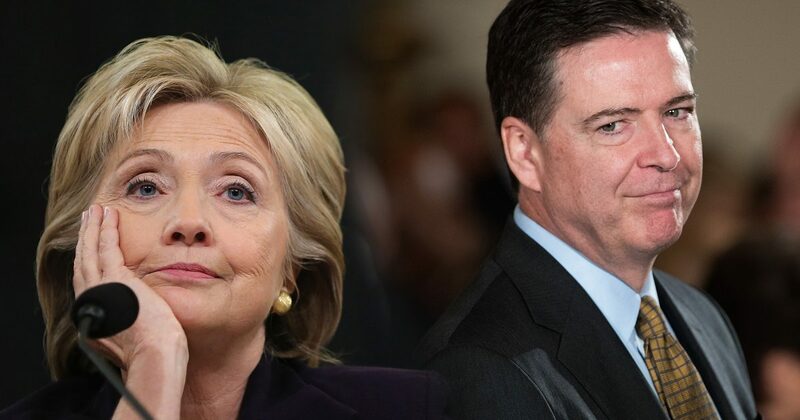 Comey announced in July 2016 that the FBI would not recommend charges in the Clinton investigation in an unprecedented statement, during which he also heavily criticized Clinton and her team for their handling of sensitive information in her use of a private email server while at the State Department. The release of the confirmation that Comey’s controversial speech was drafted months earlier than its release will give fuel to his critics that question whether he had political motives in his actions toward Clinton during the campaign. Comey was fired by President Donald Trump earlier this year, with Trump citing the Clinton investigation as part of the justification. Comey has since testified before Congress that Trump had several interactions with him as President that the former FBI director felt were inappropriate, including asking him to let go of the investigation into Trump’s former national security adviser Michael Flynn. As CNN previously reported, two Republican senators first made public that Comey had drafted the statement months before, citing transcripts reviewed by the judiciary committee of interviews with FBI aides. Obviously Santa’s naughty list doesn’t hold a candle to the list of Hillary’s transgressions. Yet, somehow she’s never been held accountable for any of her wrong-doing. The really shocking part of the Comey scandal is the fact that he made his decision long before his agents finished investigation. In other words, he didn’t care what agents uncovered. He’d already made up his mind- or someone made it up for him. Surely, we all know who that someone was. As we previously reported, Bill Clinton and Loretta Lynch brokered that deal on the Tarmac. Clearly, the Clintons used their influence to stay above the law, again. Anonymous sources in the FBI claim agents investigating Clinton were subject to higher-than-usual scrutiny. Agents had to sign “Case Briefing Acknowledgment” forms, non-disclosure agreements keeping them from speaking to anyone about the case unless called to testify. As a result, agents cannot go public with their opinions of the case, whether they agree with the final result or not. Some of those agents privately tell the Post that they are “disappointed” with FBI director James Comey‘s decision not to recommend charges. Some were even more vocal: “FBI agents believe there was an inside deal put in place after the Loretta Lynch/Bill Clinton tarmac meeting,” said one source. Comey admitted the meeting was a bad deal in his senate testimony. “A number of things had gone on which I can’t talk about yet, that made me worry that the department leadership could not credibly complete the investigation and decline prosecution without grievous damage to the American people’s confidence in the justice system,” Comey said, testifying before the Senate judiciary committee. “And then the capper was — and I’m not picking on the attorney general, Loretta Lynch, who I like very much — but her meeting with President Clinton on that airplane was the capper for me, and I then said, you know what, the department cannot, by itself, credibly end this,” he added. Therefore, it’s hard to understand why Comey cleared Clinton so quickly. Perhaps the Clintons had enough dirt on Comey to keep him on their side. We can’t be sure, but we do know this. Eventually, the truth finds a way to be revealed. As more revelations spill out, I expect to see a lot more condemning evidence the proves Comey is as crooked as a Clinton. Senator Lindsey Graham and others on Capitol Hill feel like Comey has a lot of explaining to do. They’d like to subpoena him back to respond to the emerging proof of his incompetence. The only problem is, every time he opens his mouth, Comey spins a lie. So, even if he returns to testify before Congress, Comey won’t tell the truth. However, we’ll eventually piece it together without his help.